A dental implant in Pune is the ideal replacement for a missing tooth. Dental implants in Pune, is a prototype of a natural tooth root, made of the most biocompatible metal, Titanium, which fuses to the jaw bone (osseointegrates) over a period of time. A crown is placed over it. If done well, it looks and feels and lasts like the real tooth it replaces. The dental implant in Pune procedure is the same whether one or all teeth are missing. In this example, there is only one missing lower tooth. For the purpose of demonstration we will assume the patient is healthy and is a candidate for this procedure. In many cases, Dental implants in Pune are incorporated into an overall treatment plan that might focus on the replacement of several teeth. Some patients have the option of replacing each affected tooth with a new implant, depending upon the condition of the bone. 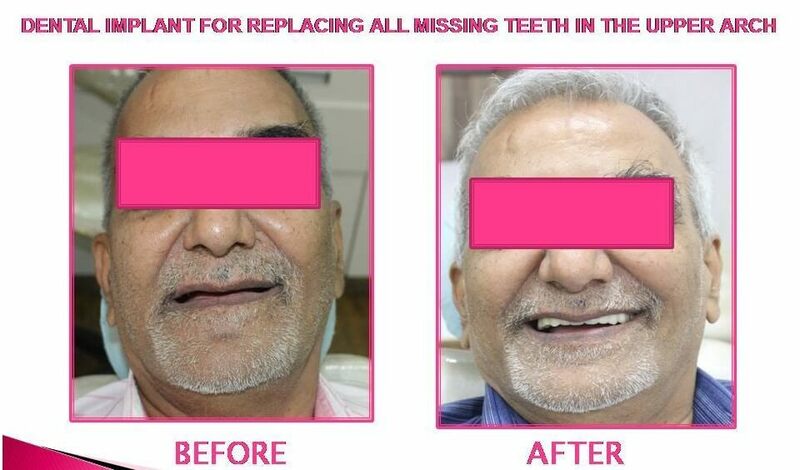 Other treatment plans may require implants for anchoring bridges and Dentures treatment in Pune. Q1. Am I a candidate for dental implants? Q2. What is the success rate of dental implants? Success rate can be as high as 98-100%. Q3. Why have dental implants become so popular? As our lifespan increases, the need for some type of permanent dental replacement system becomes very important to our overall health. Dentures and bridges have obvious problems: They are loose and unstable. Implants can provide people with dental replacements that are both functional and esthetic. The demand was always there, we just needed the tools to fulfill that demand. Moreover implants last for a lifetime! Q4. Does it hurt to have dental implants placed? Q5. I have to go without my teeth while the implants are bonding to my jawbone? Over the years, this has been modified considerably and in most situations, patients leave the office wearing their teeth the day the implants are placed. Every patient and procedure is evaluated separately and there might occasionally be a recommendation that a patient should go without their prosthesis for a short period of time. Q6. Please explain what a dental implant is? and how it's different from other types of false teeth? A dental implant in Pune is a small titanium fixture that serves as the replacement for the root portion of a missing natural tooth. It is surgically placed in the bone of either the upper or the lower jaw. The bone grows around it and anchors the implant, and a dental crown is placed over it, so that it becomes a complete tooth replacement. They can be used if you are missing one tooth, missing several teeth, and even if you are missing all your teeth. Q7. Are the dental implants long-lasting and a successful way to replace missing teeth? When dental implants were first developed back in the 1970s, they weren't very long-lasting. It took a lot of research and development to improve the success rate. Now, after more than three decades of clinical experience with over a million patients treated, statistics show that about 95 percent of individual implants are successful. The rate is even higher for bridges supported by implants. Q8. How much time is required for this procedure? Traditionally, the procedure has been performed in two steps. The Good Dentist in Pune began by installing the implant, which was left for from three to six months to heal and integrate with the jawbone. During the healing period, the patient was given a temporary prosthesis until the permanent crown could be put in place. The procedure chosen depends on several factors, such as the patient's dental health, the number of teeth involved and which teeth are replaced. These factors will also determine the total number of visits to the Best dentist in Pune throughout the treatment period. Q9. I think I'm too old for dental implants. Is old age a problem? Sometimes, older patients are concerned that their age may prohibit them from enjoying the benefits of Dental implants in Pune. However, this is not the case. Health is a key factor, but age isn't so important. Generally, if you're healthy enough to have a tooth extracted, you're healthy enough to receive dental implants. Q10. What will it feel like to have dental implants in my mouth? Implant-supported replacement teeth look, feel and function like natural teeth. This means that you can eat and drink whatever you are used to. Most importantly, Dental implants in Pune often improve your quality of life in a very concrete way. People who have felt embarrassed and worried because of their tooth problems are often overwhelmed by what new permanent teeth can do for their self-esteem. Since they feel just like having natural teeth again, it is a great boost to your confidence. They aren't going to come loose at the wrong time. You aren't going to develop sores that make them hard to wear. Q11. What can you tell me about dental implant esthetics. Will my new teeth look natural? Dental implants in Pune, if done right, are very esthetic. When you have a missing tooth, the root form is placed in your jaw, and the crown is attached to it. Therefore, your tooth looks like it is growing out of the gums, exactly like a natural tooth. Q12. How about implant function? Will I be able to chew the same, using the same force and pressure as with natural teeth? They also feel as secure as natural teeth, since they are anchored in the bone. It wasn't too long ago that an extended healing period of up to six months was required before these fixtures could be used. 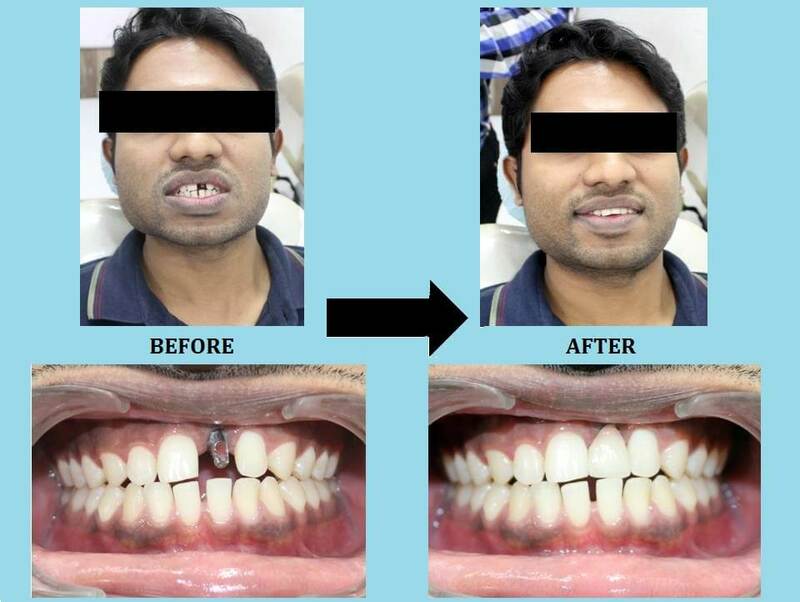 During this healing period, the patient would wear a dental flipper or other temporary tooth replacement to avoid placing stress on the dental implant in Pune during the healing period. 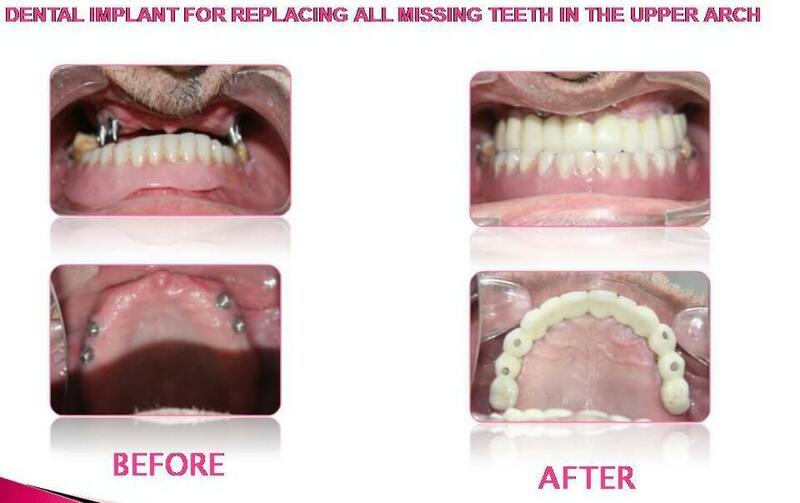 Our specialists however have kept up with recent developments and can place implants that function immediately. It's called the teeth-in-an-hour concept, and what it means for you as a patient is that the surgery is much simpler and you can leave the placement appointment with permanent teeth that you can use right away. Q13. What about post-operative discomfort? How will I feel after the treatment? Q14. 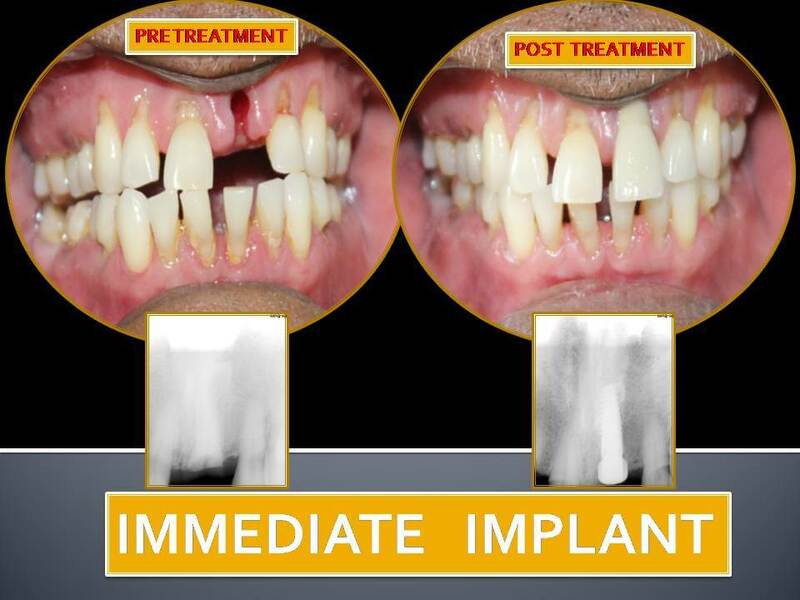 What kind of implant maintenance is required? How should I care for my new teeth? It's also important that a dentist trained in maintaining dental implants see’s you. Many people are surprised to learn that, just as natural teeth can succumb to gum disease, Dental implants in Pune are also subject to gum disease that attacks the attachment between the implant and your jaw. To avoid this gum disease, keep them clean and maintained with faithful brushing and flossing and professional cleanings. 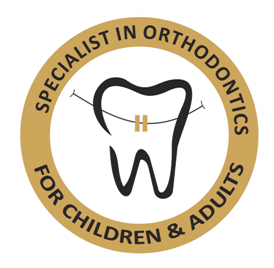 • Conservative: To place a bridge, the teeth on either side have to be grounded down and crowns are placed. This is avoided with an implant. Since your healthy teeth are left untouched, this can have a significant long-term benefit for your oral health. • Durability. Implants are very durable and will last many years. With good care, many implants last a lifetime. • Improved comfort : This will act and feel like your own tooth. Unlike dentures, it won't shift or come out. You will be able to speak and eat with confidence and comfort. Say goodbye to misplaced dentures and messy pastes and glues. • Improved appearance. Dental implants look and feel like your own teeth. And because they are designed to fuse with bone, they become permanent. • Improved speech. With poor-fitting dentures, the teeth can slip within the mouth causing you to mumble or slur your words. Dental implants in Pune allow you to speak without the worry that teeth might slip. • Easier eating. Sliding dentures can make chewing difficult. Dental implants function like your own teeth, allowing you to eat your favorite food with confidence and without pain. • Improved self-esteem. Dental implants in Pune can give you a Smile designing in Pune back and help you feel better about yourself. • Improved oral health. Dental implants don't require reducing other teeth, as a tooth-supported bridge does. Because nearby teeth are not altered to support the implant, more of your own teeth are left intact, improving long term oral health. Individual implants also allow easier access between teeth, improving oral hygiene.